Friedman School researchers estimate that changing the price of some foods by 30 percent would prevent 63,268 deaths from stroke, diabetes, and cardiovascular disease in the United States each year. 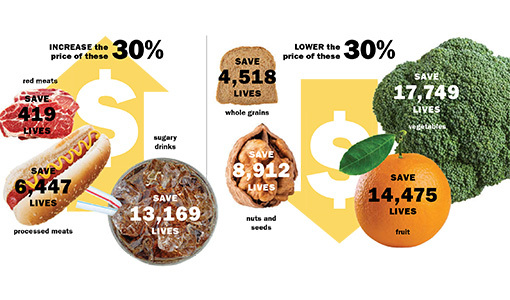 (Tweaking the price of the foods by just 10 percent would prevent 23,174 deaths each year.) The idea behind the study, published in BMC Medicine, is that taxing the bad foods and subsidizing the good would prompt Americans to shop and eat healthier, with big results.